Known Bugs: Search causes the text to disappear. The Complete Sherlock Holmes on CD rom. This application was originally by written myself for Cumana to bundle with A5000 computers to schools. A number of people still find it useful, even on much more modern systems, so I updated it to work with newer font managers and RISC OS 4/5, including Select. 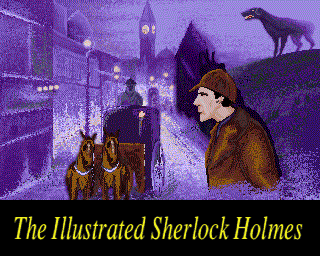 For those of you who don't have the original CD Rom (which I believe is no longer available, even from thee who hath it in stock), you can download the full data for Sherlock, complete with illustrations. This is 6MB long as a ZIP file and extracts to approx 12.5MB. Download: SherlockData.zip [6M], downloaded 202 times. N.B. The download version does not include the audio tracks, which total 440MB. You will require the original CD if you want the music. Contains text of all Sherlock Holmes stories. Contains reproductions of original woodcuts. Search routine doesn't work yet. I'm investigating this problem, but if you perform a search, the text in the main text window disappears. This is probably a silly typo in the 32-bit conversion somewhere, so watch this page for updates. No Audio. There are no audio tracks included in this version, although the player code is working ok. The audio comes to approx 402MB so is too large to make into a download. If you want to have the original audio, I suggest you try locating Sherlock on CD. 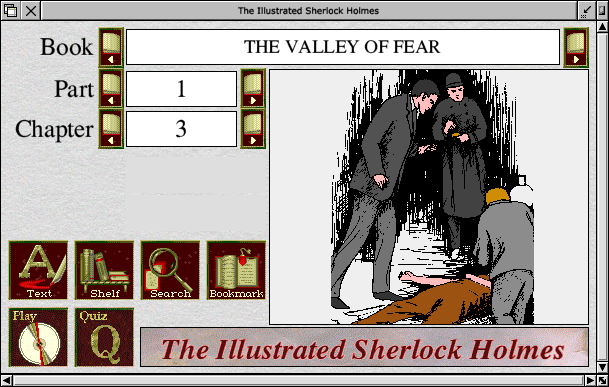 If you find !Sherlock useful, you may be interested in The Illustrated Holy Bible or The Illustrated Works of Shakespeare, which are also available as RISC OS multi-media applications. a) Made 32-bit compatible and tested on the Iyonix. a) Extended Font allocation and tested ok ok Risc PC's and StrongArm machines. a) Pictures now load correctly after displaying credits. a) 's' local variables tidied up to prevent 'add ex' error. b) search speeded up by removing index loading. a) Search window cleared as new search is started. b) Typing in part number goes to correct part. a) bookmark 'goto' extra bug fixed. b) Bug in text centring fixed. a) bookmark 'goto' bug fixed.